There are some tools and ingredients in the kitchen that are totally life changing. Like that time I bought a mandoline, or a julienne peeler; or starting using coconut oil when making granola, or discovered epic red curry paste. This is the story of life changing red curry paste. We had been on the hunt for a good red curry for a while -- probably since this lady whipped up an amazing thai curry two years ago in her adorable little mountain home. She had the good stuff, and as hard as I looked, I couldn't find it anywhere on my side of the ocean. I was unimpressed with the brands I'd find at the grocery store -- pricey, lacking kick and really just not that good. We live quite close to Chinatown, and stumbled into the curry aisle of a local supermarket a few weekends ago. We bought a brand we had never seen before, and our curry lives will never be the same. A few panangs and massamans later, I decided to switch it up and mix the curry paste with miso, then smother some seasonal veg and soba noodles with it. Yum. Whisk together the olive oil, miso, red curry paste and lemon juice. Set aside. Cut the ends off the butternut squash, then carefully, using a carrot peeler, peel off the skin (trust me, this step makes cutting the squash that much easier). Cut the squash into cubes and transfer into a large bowl. 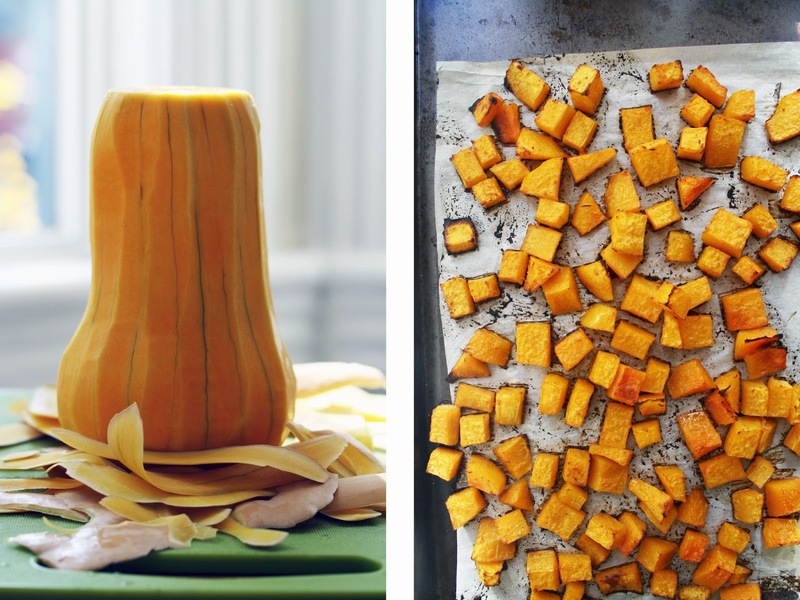 Toss the squash with 2 spoonfuls of miso curry and spread onto a parchment lined baking sheet. Repeat with the cauliflower florets and chopped onion - toss with 2 spoonfuls of miso curry, then spread onto a parchment lined baking sheet. Roast for 30 minutes. Remove the cauliflower/onion tray and continue roasting the squash for another 30 minutes. While the veggies are roasting, rinse the kale and tear (or cut) it into medium-small pieces. 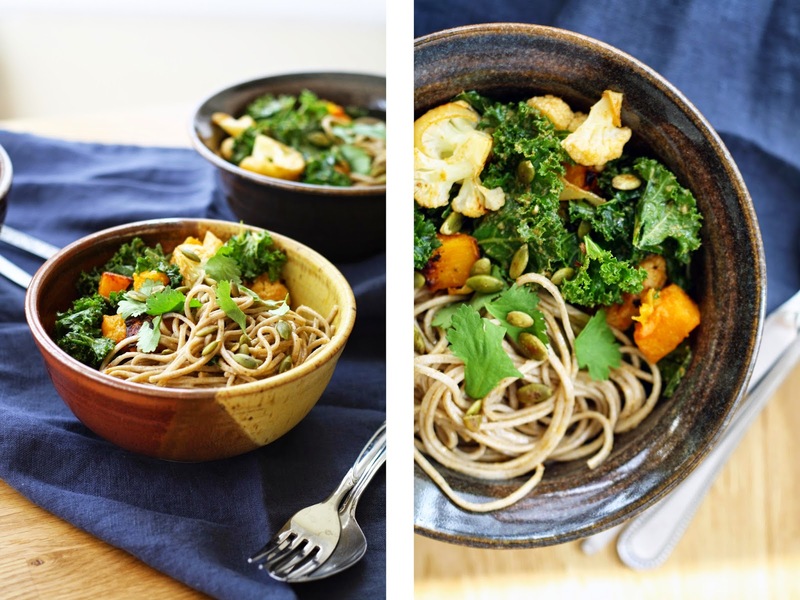 Toss the kale in a large bowl with 1-2 spoonfuls of miso curry. 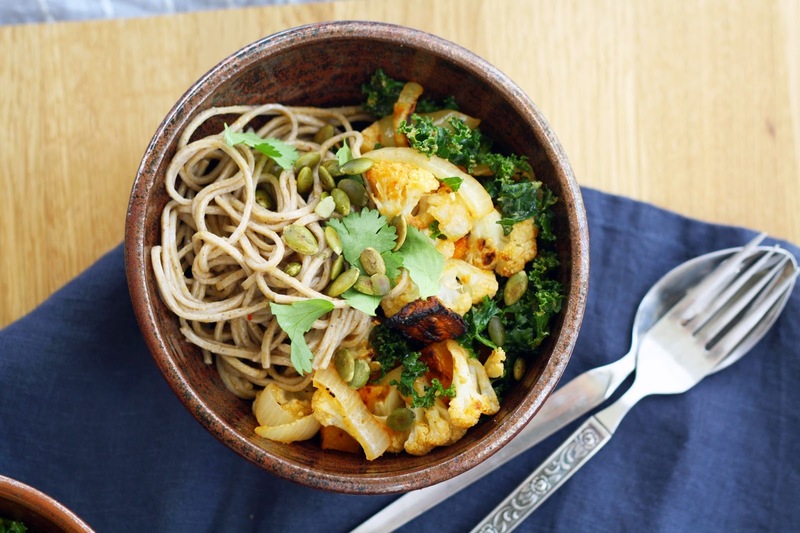 In a separate bowl, toss the soba noodles with some dressing as well. After an hour in the oven, the squash should be ready. Add the squash, cauliflower and onion to the kale and gently toss everything with your hands. If you're adding chicken or tofu, do it now. 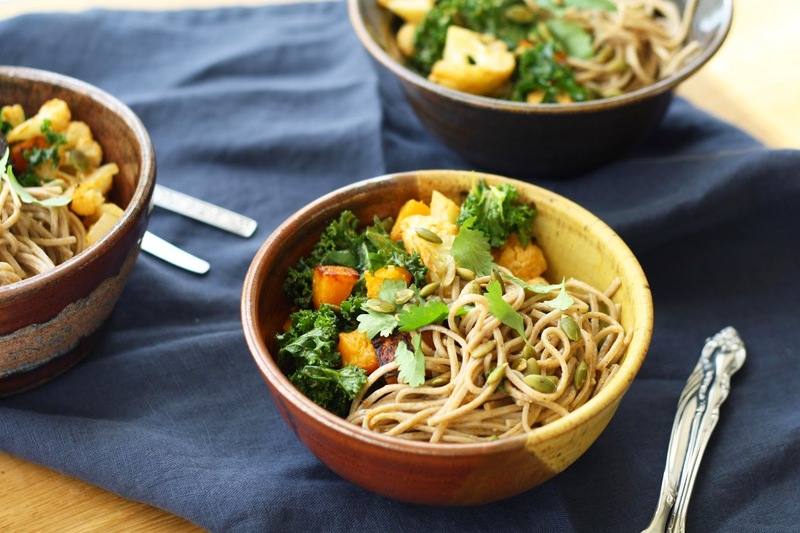 To serve, place a mound of soba noodles in a bowl and top with a large serving of vegetables, and a sprinkle of toasted pepitas and fresh cilantro.